Blueberry Muffin recipe link. Note: I add a crumb topping to my muffins, which isn't in any of my recipes, but my sweet tooth requires it. I mix approx. : 1/4 cup brown sugar, 2T flour, 2T butter, dash of cinnamon, and some uncooked oatmeal for texture. Sprinkle over each right before baking. My little tip, that you probably already know, is to write everyone's name down with your phone number for the new neighbor. I have moved a number of times and both my husband and I are TERRIBLE with names. No sooner do we close the door and turn to each other with a "what was his/her name" and neither of us remembers! It goes in and out! I've read all those name/word association tips and actually, once or twice even tried them, but for the most part I'm horrible with names. So that's my little suggestion for welcoming newbies to the 'hood. Please add your tips in the comments! AND ... I received ... ...an AWARD!! This was so fun! 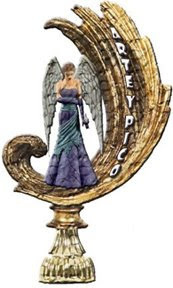 The Arte y Pico award is to honor creativity, design, interesting material, and contributions to the blogging community. A big thank you to Misty at Rainy Day in May for giving it to me! Please visit her great blog! And now I get to pass it along to 5 bloggers of my choosing! http://www.heatherbullard.typepad.com Heather is a fabulous source for "pretties" with her unique "modern vintage" style. http://littlemommaandcompany.blogspot.com Emily has the best pictures! http://www.barbarajacksier.blogspot.com Barbara is an uber-talented book editor/decorator! http://mabelshouse.blogspot.com Liz's writings are fun and reel me in! http://fleamarketstudio.typepad.com Lilia's posts are jam-packed with gorgeous photos ... just the way I like to "read" a blog! Yay! Jeanne! Congratulations. The award is well deserved! By the way, the muffins look yummy. What a good neighbor you are. Yum. The crumb topping sounded so delicious I could almost taste those muffins.And, thanks for the award. My gift to new neighbors is a tiny memo pad (like kids used to us to jot down their homework assignments before kids started carrying palm pilots) with a few pages of my recommendations. One page is the service people (like tree trimmers and plumbers)that I use. I also list a few things that pertain to the family. Little kids? I list soccer associations and resale shops. Pets? I list dog parks, pet food stores and my fave vet. Awesome tips, Barbara!! Thanks for sharing those with us!! What a wonderful neighbor you are! The basket of muffins is beautiful. They look both delicious and welcoming. I love the card you tied on as well. Hi Jeanne! Thanks so much for the award, you are too sweet! And I'm SO hungry for blueberry muffins now! Yummy. Did I miss the recipe? They look so awesome. Can you please post it? That would be so nice to have. Thanks! 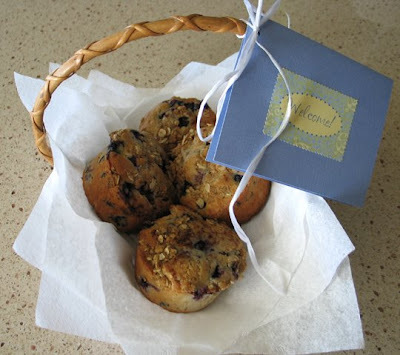 I added the link to the recipe for the Blueberry Muffins.